This week I'm working on my Rainbow Adorn for the Rainbow Mini Quilt Swap round 2. This is one of the few mini swaps I am allowing myself to sign up for this year. 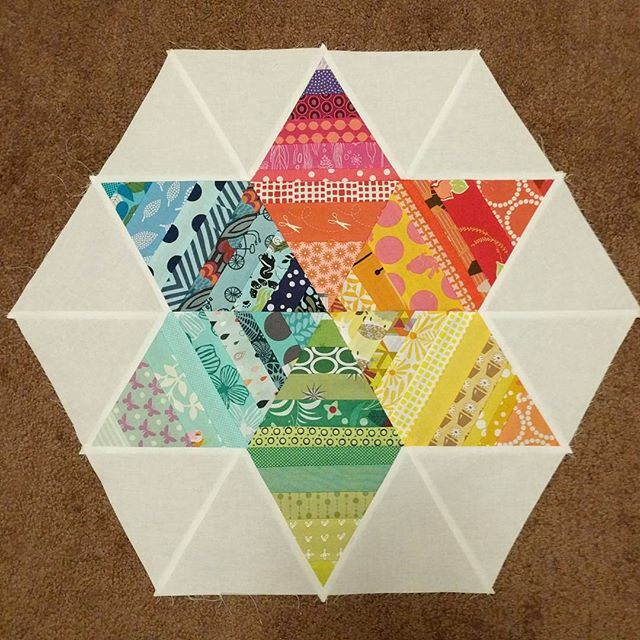 I wanted to try and make a mini that wasn't a square or rectangle, so I looking at patterns I found the Adorn mini in Simply Retro and knew I could alter the pattern a bit to make a hexagon. All I had to do was remove a few background triangles and proof, hexagon! This was my my first time sewing with triangles. I had to unpick a few seams and resew, but it's all apart of the learning process. I'm already scheming up a new mini for myself! Love all the pretty fabrics you have used. Great job!!! What an eye-catching little mini! Love the colors and the shape. Very cute! I need to start working on my mini for the same swap!